Scientists at a British concrete manufacturer, the London-based Novacem, claim to have developed a new form of concrete that effectively absorbs large amounts of carbon dioxide as it hardens. Novacem’s new version of concrete, uses a different raw material, magnesium sulphate, which requires much less heating. Novacem claim that each tonne of cement can absorb up to 0.6 tonnes of CO2. This is opposed to figures that claim that each tonne of old style cement emits about 0.4 tonnes of CO2. For any building material to actually absorb carbon rather than just emit it in its production, is really a breakthrough, though Novacem admit the material is still in its trial period. 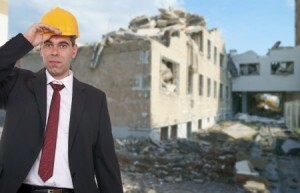 The consequences of having an environmentally friendly building material available and on the market for builders to use, and for architects and designers to insist on using in the design of buildings and roads, is immense, and a real development for a sector which has been very guilty of creating carbon emissions through building operations. The British Cement Association have reacted with some scepticism to Novacem’s announcement, stating that they have several non-cement alternatives being tested currently, and that there is little worldwide geological availability of other materials to create such alternative concrete, without the traditional cement. Novacem state that they estimate that there are around 10,000 billion tonnes of magnesium silicates available worldwide, and that their process could use alternative byproducts as well that also contain forms of magnesium. 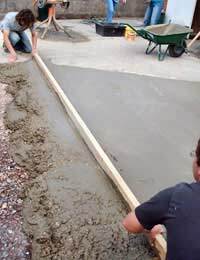 Novacem is so confident of the sustainable and carbon negative potential of this new product that they have initiated a 1.5 million pounds pilot plant project in the UK, to further research this new type of concrete, experiment with it and seek the necessary licences to manufacture it. The product itself could be several years away from being available to the building public and the building trade in general, but it does have great potential, and is eagerly awaited. As the number of LEED certified projects grow, some cities have policies in place to ensure faster growth than others. One such place is Washington D.C. Learn about the ways in which general contractors are profiting and capitalizing on the boom in renewables. From installation to manufacturing; solar, wind, and all other renewables present a lucrative opportunity for commercial building firms. Environmental Leader has published a new article detailing many of the benefits of green building that are not immediately apparent. Lower operational costs have long been the most cited reason to build green, however more benefits can be realized. From composting toilets to electric lawn mowers, BuildingGreen’s list offers a forecast for what’s on the horizon in the rapidly evolving green building industry. The green building market is teeming with manufacturers seeking to develop products and materials that reduce a building’s overall embodied energy while standing up to stringent performance criteria — all in the hopes of helping to create a more sustainable construction industry. Let’s hope that manufacturers continue to search out new materials and design new products that help reduce construction’s impact on the environment! The financial benefits of green building have been well established. Studies have repeatedly shown green building certification such as LEED and BREEAM lead to lower operating costs, such as reduced utility bills and lower total lifecycle costs. Another business benefit: building owners report seeing a median increase of 7 percent in the value of their green buildings compared to traditional buildings. So it’s not that surprising that green building is outpacing overall construction growth in the US. But as green building increasingly becomes the norm, driven both by market demand and environmental regulations, some savvy developers and owners and looking to the next phase of green building: healthier buildings that improve employee wellness. These buildings are better for the environment. They incorporate features like daylighting, which decreases electricity use, and zero volatile organic compound paints and glues, which reduce greenhouse gas emissions. The top five healthy building features in use are better lighting/daylighting exposure, products that enhance thermal comfort, spaces that enhance social interaction, enhanced air quality and products that enhance acoustical comfort. As these buildings continue to show benefits including being healthier for the environment, healthier for human inhabitants and saving — and making — money for developers, facility owners and managers, we expect to see more construction industry leaders getting behind this next phase of green building. Home building pros are familiar with special window coatings that save energy, but a Columbia, Md.-based manufacturer is taking that concept a step further with commercial window film that generates power. BuildingGreen, publisher of EBN, has announced the winners of its annual Top-10 Green Building Products awards. The 13th annual awards recognize green building products that make fundamental transformations to “business as usual” in the design and construction industry. This year’s picks include products that have eliminated halogenated flame retardants, a longstanding health and environmental issue, along with a highly effective air- and weather-barrier system, chairs made from a new biobased plastic, and high-efficiency chillers using near-frictionless compressor rotors. Here’s a link to the 10 greenest buildings in the world. It’s a great start! 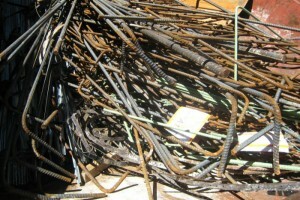 The gals at www.buildsitepro.com thought you might enjoy this interesting article about recycling! Building demolition demands a lot of heavy machinery to crush concrete and separate valuable materials for reuse. Often, those materials are transferred to offsite locations, which wastes time and resources. The process also wastes a lot of water in order to prevent harmful dust clouds from blooming. However, a Swedish student’s concrete-eating robot aims to change all that. 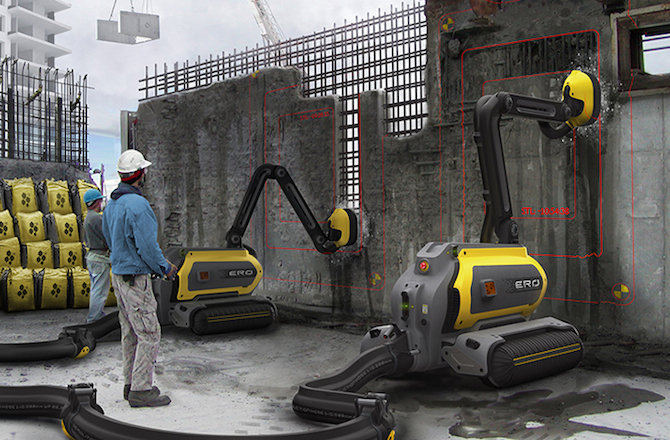 The idea is to send in a fleet of the ERO robots that will scan buildings to determine the best route to execute demolition. Once the robot goes to work, using vacuum suction and electrical power, it erases the building. Turbulence dynamos strategically placed inside air suction chambers even provide a percentage of ERO’s energy needs. Once the last wall has been demolished, essentially nothing has gone to landfills or been sent away for additional processing. So far the design remains a concept, but influential organizations are starting to take note. Last year, Haciomeroglu’s concept won in the Student Designs category of the International Design Excellence Awards. Interesting new developments from the Green Building Industry! Forbes Magazine reported today that an innovative green building products company called bioMason has created a brick made form bacterial byproducts that cement sand particles together in a matrix that is strong enough to use for homes. In only five days, bacteria create a natural cement similar to coral that binds aggregate into a brick. Since waste from residential and commercial building activities accounts for around 40% of landfill wastes, this product could be a cheap, renewable, and biodegradable alternative to regular concrete in the near future. For more information visit the following link: Self-Repairing Concrete Could be the Future of Green Building. 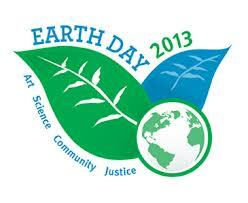 Happy Earth Day from the Surface Protection Experts! Builders and contractors are more concerned than ever about using recycled materials, conserving resources, and “going green”. Surface Protection helps tremendously by allowing builders to prevent damage to expensive fixtures, which often results in these fixtures needing to get thrown away. Remember to use surface protection on your next project to stay green! While Green building continues to pick up, fewer firms pursue LEED certification, according to a new survey conducted by McGraw-Hill. The report indicates a significant increase in demand for green building over the last ten years. Builders report that they are not pursuing LEED because of the perceived costs and difficulty of the certification process. The Surface Protection Experts just stumbled onto a great website and cause called “The All American Home“. “The All American Home” asks the construction industry to commit to reallocating 5% of spending towards products made in the USA.It encourages builders and contractors to buy locally-made products rather than cheaper goods made in China or other foreign countries. Toilet Sheath™,Door Guard™, Tack Guard™, Cabinet Foam™, and Swift Wrap™ are made in the USA and were designed and manufactured by Builders Site Protection. In addition, many green products including Edge Pro corner guards, and Sill Pro sliding door protection are also made in the USA. Check out “The All American Home” website to learn more or take the pledge!